Removal ProcedureRaise and support the vehicle. 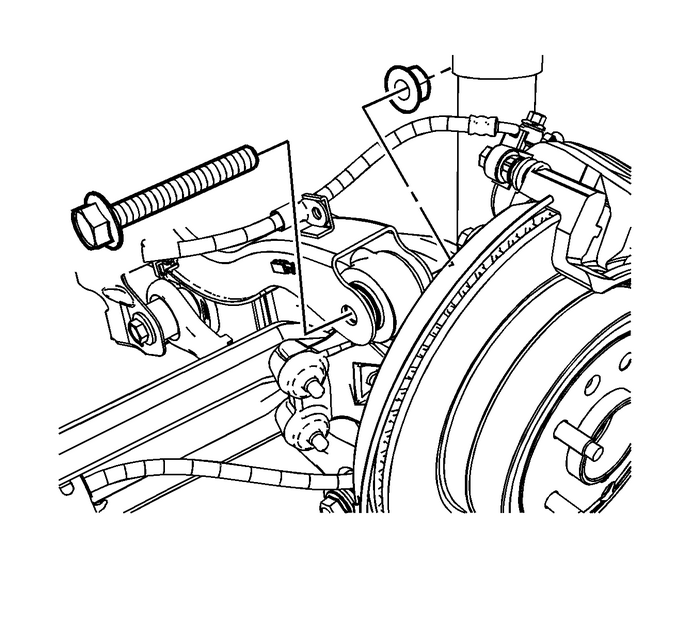 Refer toLifting and Jacking the Vehicle.Remove the rear tire and wheel assembly. 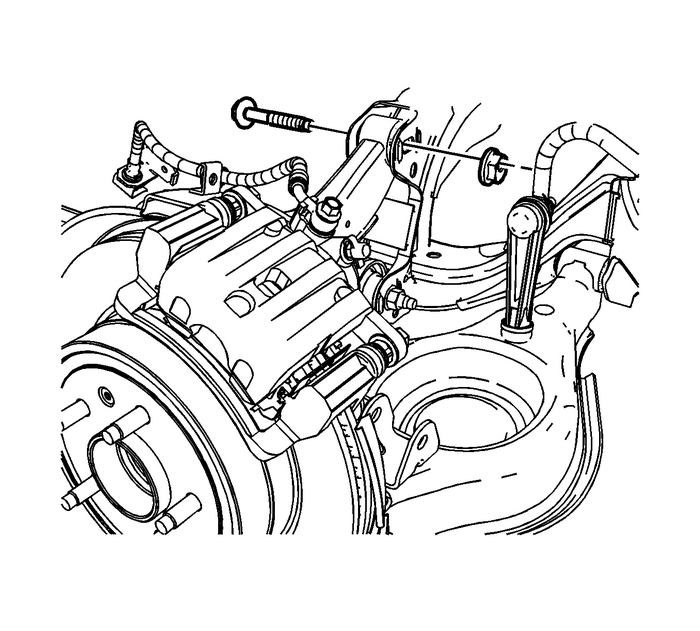 Refer toTire and Wheel Removal and Installation.Disconnect the antilock brake system (ABS) brake wiring harness from the upper controlarm.Remove the rear brake hose bracket to upper control arm nut and bolt. Remove the upper control arm to knuckle nut and bolt. Install the upper control arm to the knuckle.Loosely install the upper control arm to knuckle nut and bolt. Install the upper control to support bolt and cam nut.Install fuel tank, if removed. Refer toFuel Tank Replacement.Install fuel tank filler pipe, if removed. Refer toFuel Tank Filler Pipe Replacement. Tighten the upper control arm to knuckle nut and bolt to 160-Y (118-lb-ft).Tighten the upper control arm to support bolt to 164-Y (121-lb-ft). The rear brake hose bracket must be installed on the side of the upper control armbracket closest to the front of the vehicle. 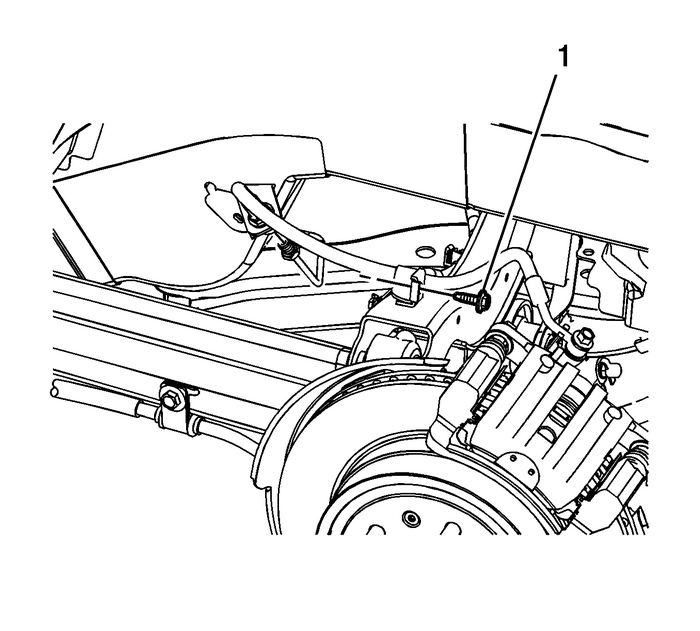 The rear brake hose bracket must be installedparallel to the upper control arm.The head of the rear brake hose bracket must be installed facing the rear of the vehicle.Install the rear brake hose routing nut and bolt-(1)-and tighten to 25-Y (18-lb-ft).Connect the ABS brake wiring harness to the upper control arm.Install the rear tire and wheel assembly. Refer toTire and Wheel Removal and Installation.Lower the vehicle.Check the rear alignment. Refer toWheel Alignment Measurement.